The MonoRover R2 Self-balancing Scooter is an amazing scooter scooter for a fraction of the price of an IO hawk or the Phunkee Duck scooters. It will carry heavy weight so you can easily have two grocery bags with you. As long as you can manage to maneuver it. It’s a perfect scooter for those who want a little more speed 8 MPH to be exact. It is reliable and are made of high quality scratch resistant plastic. It is a tested long distance scooter with a great 1-year warrant and a 30-day cashback guarantee. You don’t have to be too careful while in the learning phase. Speed, 8 MPH which is more than enough for normal use. US Shipping, Delivery from LA within 3-6 business days. Max Weight, Tested with 297 lbs it did pass the weight test with elegance. Warranty, 30-days money back guarantee and a 1-year replacement warranty(Only from approved resellers). Fake models, There are a few re-sellers with rebranded/fake models. These are not always the cheapest either so watch out for them. and follow our links for authorized re-sellers. Error, Some people had received faulty hoverboards, these seem to have been changed out fast and with no extra cost to the buyer. If its an authorized re-seller. We tested the MonoRover R2 electric self-balancing board and it is a great choice if you want a scooter that can go the distance. With and excellent range varying between 11-13.5 miles per charge depending on the surface. You will definitely be able to run this scooter for hours on a fully charged battery. It has a charge time of 2-3 hours. But from our testing you will most likely not run out of juice before you need to take a break. Many people nowadays are looking for hoverboards with more features, like bluetooth, remotes and even App functions. Something that the Monorover R2 lacks unfortunately. It has a top speed at 8 mph which is about 0.8 mph faster than the average scooter standards. It was easy to maneuver and it has a max weight limit at 220 lbs. We did test it with over 290 lbs, 297 to be exact and it ran as smooth as every. So if you are a big solid man/woman this scooter is perfect. 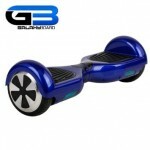 Hopefully the monorover wont end up just like the Galaxyboard, disappearing. It ran smooth during all our testing and after 20 km we had plenty of battery left. 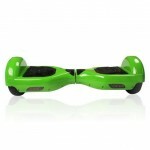 This self-balancing board comes with a great warranty which gives you a new one if yours breaks down. All you have to do is make sure you buy one from an authorized re-seller. After that make a video showing the faults and send it to MonoRover and you will get a replacement scooter. Some didn’t even have to ship the first one back so then you have a spare battery and parts for future use.